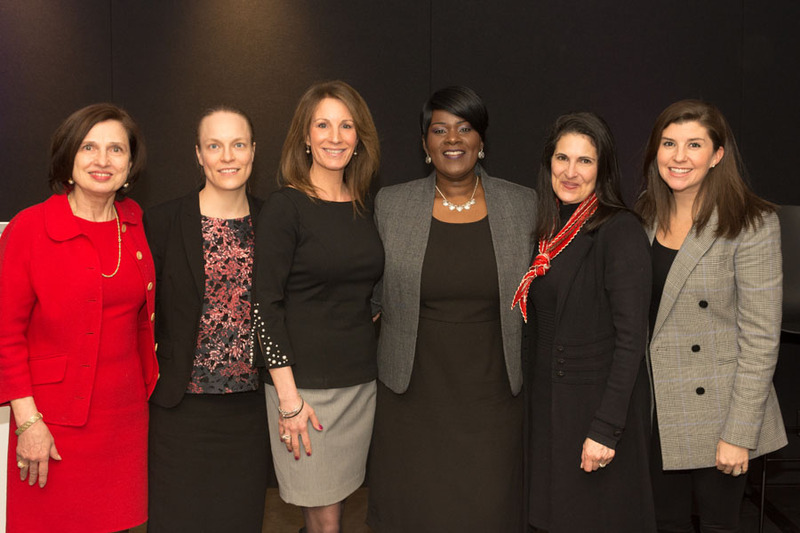 (January 31, 2019) The area's top women in commercial real estate gathered at Convene in Rosslyn last night for the CREW National Capital Committee's annual State of the Market and Economic Forecast. Jeannette Chapman, CREW's chief economist, kicked off the discussion, and was followed by some of the area's most talented leasing experts and strategists in the local commercial real estate industry, including Cathy Delcoco, Executive Vice President, CBRE; Wendy Feldman-Block, Senior Managing Director, Savills Studley; and Andrea Murray, Senior Vice President, JBG Smith. Each one provided her unique perspective on the direction of the commercial real estate market in Northern Virginia, D.C. and Maryland, respectively. Rosslyn BID President Mary-Claire Burick moderated the discussion. As professional services and other non-governmental industry sectors grow, our economy is no longer as reliant on the federal government. The lessening of the region's dependence on the federal government increases the stability of the Washington, D.C., metropolitan region's commercial real estate market. Companies are choosing to locate in buildings that are new or highly amenitized, as well as in neighborhoods with many offerings (e.g., entertainment spaces, restaurants and grocery stores). Employees want this and their employers know it! Coworking is changing the commercial real estate landscape. The region has experienced incredible growth in this industry and market experts are wondering if we've reached the tipping point or if it will continue to grow at the same rate. The metro region has had four consecutive years of above-average job growth, which is remarkable. Private office-space jobs are increasing compared to federal government or public agency jobs. This continues the diversification of the D.C. region’s economy. There's a 25 percent chance we'll see a minor recession around 2020 that will be driven by consumer confidence. Amazon is an important addition to the overall economy, but it doesn’t fundamentally change who we are as a region. Slow and steady growth characterizes who we are! 2018 was a year to celebrate for Northern Virginia. It was the best year for commercial real estate since 2008. For the past several years, companies have "right-sized" by choosing more efficient workplace designs requiring less space and reducing the demand for commercial real estate. Now, the market has adapted and the industry is likely "over the hump" of major impacts. Amazon's arrival in Northern Virginia will have a big effect on higher education here. George Mason University's Arlington Campus and Virginia Tech's planned Innovation Campus at National Landing will increase the number of graduates with technology degrees, fostering a robust tech and innovation workforce. Data centers are a big part of Northern Virginia's commercial real estate market. Northern Virginia is the largest data center market in the world. Wendy Feldman-Block's take on Washington, D.C. The game-changer in D.C. commercial real estate this year: coworking. It has been the strongest source of new net growth in D.C. Many of the District's top leases were coworking spaces. It's a great time to be a tenant in D.C. There are many new construction options and motivated building owners. Southwest D.C. and The Wharf have seen a surge in popularity. Core markets such as the East End are still strong when it comes to building sales. D.C. boasts an abundance of housing that may appeal to Amazon employees, particularly in Capitol Riverfront and Southwest. Most millennials in the metro area live in Arlington and D.C. The epicenter of the region's millennial population is at 14th and U. This is where the talent lives! Over the past 15 years, Bethesda has not experienced much new construction. This is changing, with several new projects currently underway. Expect some migration within Bethesda among companies that want to upgrade their space but stay in the neighborhood. In Suburban Maryland, amenities have driven success in non-Metro locations. Maryland boasts a booming Life Sciences industry. New construction is increasing along the I-270 Corridor as the number of biohealth tenants continues to grow. In Downtown Bethesda, a planned "vertical lab" will bring life sciences companies to a higher rent area than they typically locate. Companies see the value in this core location's ability to attract talent. These presentations were all organized by Commercial Real Estate Women (CREW). Founded in 1989, CREW is a professional association that aims to advance women in commercial real estate through programming focused on business networking and social and educational programs. It has three strong chapters in the D.C. metro area and always welcomes new members. Learn more about CREW here. Speakers at CREW's Annual State of the Market were Cathy Delcoco, Executive Vice President, CBRE; Jeannette Chapman, CREW's chief economist; Rosslyn BID President and event moderator Mary-Claire Burick; Julene (Jay) Pruitt, Senior Vice President/National Director, JLL and CREW NOVA President; Wendy Feldman-Block, Senior Managing Director, Savills Studley; and Andrea Murray, Senior Vice President, JBG Smith. PHOTO BY TREVOR CHAN, COURTESY OF CREW.